Finding and engaging passive candidates just got easier! 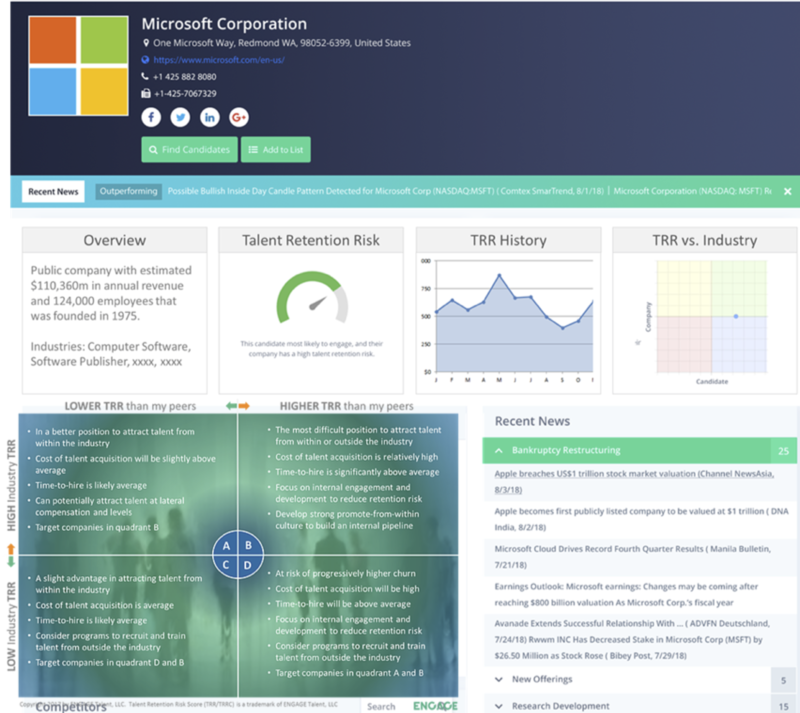 ENGAGE aggregates data from over 30K sources to create talent profiles on 100M professionals and 13M companies. Our AI and machine learning engine predicts the likelihood that a candidate will respond to a conversation about a potential job change and recommends personalized messaging based on factors like their career progression, skills, peer actions, and the news and events surrounding their company. Find New Talent Pools at the Right Time with the Right Message! ENGAGE helps recruiters connect with new talent pools, at the right time, with the right message. The result is a more efficient and productive talent acquisition team who fills roles proactively by engaging qualified talent instead of waiting for the right applicant to come to them. By leveraging ENGAGE predictions and recommendations, customers have identified candidates for difficult-to-fill roles in a fraction of the time and doubled their candidate response rates. Get Candidate, Competitive, and Market Research in One Platform! ENGAGE is the first HR technology to combine Candidate Research, Competitive Research and Market Research in one seamless platform. Studying the intertwined relationship between an employee’s industry, company, and relative experience yields a deeper understanding of someone’s alignment with their current role and potential new roles. Although we are a science and data company leveraging the most advanced machine learning and AI technologies, the results of our pioneering work are very human: we connect people who are no longer aligned to their role or company with better opportunities for growth and fulfillment. The results are increased productivity, job satisfaction, and healthier economies. 100M+ Passive Candidates and almost 14M Business Profiles Updated Daily! 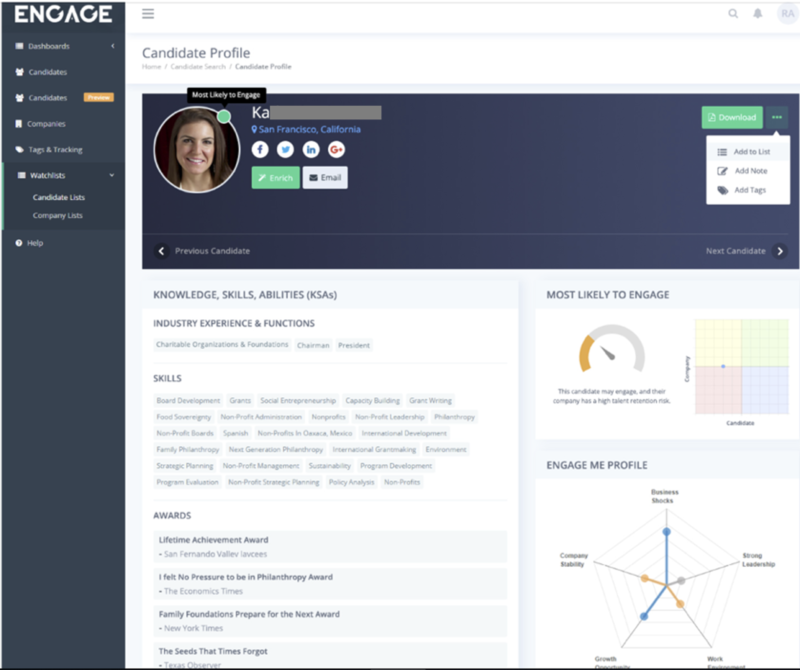 ENGAGE enables active recruiters to efficiently source from a live stream of over 100 million passive candidates or enrich their own CRM and ATS candidates with predictive, AI-based insights. ENGAGE continuously monitors your candidates and alerts you with predictive availability signals when a candidate is likely ready for a new opportunity. Recruiters who leverage ENGAGE’s predictive analytics are able to more than double their candidate engagement rates.